Thanks to Nafy for making the video! Several people have told me that I should interview Yasuhiro. I found the suggestion hard because first, I don’t know him, and second, I was never be able to find him. Apparently his time zone is different than mine. But I finally found him in the early morning. After he finished playing “Coin Catcher,” I then asked him for the interview. Nadia = Hey Yosuhiro, I heard you are from Japan. Which island? N = What kind of job do you do there? Y = I am a Sales Representative and Buyer of funitures and antique art company. N = So, what kind of history are those antiques? Y = The oldest furniture we ever had on display were dated back to 17th-century on which of some had been used by the European authorities and kings. N = What kind of price are we talking here? Y = They vary, but all the price has been decreased since Japan is in bad economy. N = Who are your usual customers? Y = Our target customers are high class that are well paid salary including presidents of companies. They are also our repeating customers. N = To sell the furnitures, what kind of sales trick do you do? Y = We usally ask them to come to see art and antique festivals or exhibition, and sometimes I made a sales visit too. N = Have you ever purchased any furniture from your work? Y = Yes. Not furniture but ceramic art. N = Do you also furnished your home with the traditional Japanese furniture like sitting on the floor with pillows? Y = No. I like modern designers furniture. I usually buy MOMA’s merchandise at Conran shop. N = What do you do in your spare time? Y = I usually go shopping for fashion or audio equipment or go out to eat and drink with my friends. I sometimes go to hot spring bath in rural places by my car to my favorite vacational trips. In these trips, I like to go to stay-in at the traditional hotel (it’s called Ryokan in Japanese) where they have hot spring bath. I enjoy taking a hot spring bath and watching starts at night. N = Are the spring hot bath different than the regular home bath? Y = No. But the spring bath that located at the outside rural area has a better quality of water. N = Does the traditional hotels always have spring hot bath? Y = No. Not all of them, but the ones I usually stays are. N = Are these traditional hotel expensive? Y = It depends. But I usually pay $80 to $200 at max including dinner and breakfast. I don’t know if it is consider as expensive. N = How did you find out about SocioTown? Y = I was searching a word “Social MMO game” on google after I got bored playing with another MMO game. N = What kind of activities do you like the most in SocioTown? Y = Good question. I like meeting new people at first and then I like enjoying buying the avatar’s clothes. After talking with Yasuhiro, he makes me eager to try Japanese hot spring bath. Can someone tell me how much do I have to save up for a trip to Japan? I’m sure some of you have encountered a time when you didn’t get out of your apartment on certain days, only to miss out on an item that came in rotation. I’m here to help. Check back often for a list of items that is being sold in stores that day. Would you also like to be updated on Low-Mart’s daily catalogue as well as Franklin’s Furniture, or are the clothing stores enough? This month is very well known as the month of giving, and we’ve made it possible to do just that in SocioTown. Our new feature allows you to give a wrapped gift to friends in SocioTown for Christmas, and only during and after Christmas day, December 25th, can the gifts actually be opened. Till then, you can place your gifts in your apartment! 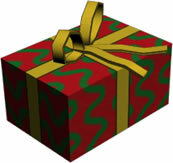 Now, in order to give someone a gift, go to the person’s profile. There’ll be an option to give a gift, which you can choose from your inventory. I found Tolleomi while she was taking her lunch break. Though she only has a few minutes left, she agreed to spare them with the SocioTown. Nadia = Hi Tolleomi, where do you live? Tolleomi = I live in Alabama, USA with my children. N = I heard you are a teacher. Is that true? T = Yes, I have been a teacher for the last 9 years. I teach German for middle school (grade 6 - 8 ) students. N = Sorry, but I’ve never heard of elective second language being taught in a middle school but in High School instead. Is it a public school or a private school? N = Do you have any memorable experiences? T = 1 year I took them to see a German opera and it was a great success. And I take a group of students to an elementary school to teach the little kids German. And I also take them for their 11-days trip to Europe every other year. About 20-30 students usually join this trip. N = What kind of places do you take them for their Europe trip? T = We take them to Germany, France and Spain. Places such as Munich, a concentration Camp, to Paris and the Eiffel Tower, the Louvre and Versailles, to Barcelona to see Gaudi art, etc. N = Do you still have family in Germany? T= Yes, everybody except my children. And I was just there last week to visit. I might moved back to Germany permanently. N = When you take your students to Germany do you take them to see your family? T = No. Only sights. This trip lets the students experience things that they haven’t seen or done. Up until a few years ago they could even taste champaign. N = Where you in town when the Berlin Wall was destroyed? T = No. I wasn’t. The Berlin Wall was destroyed in November 9, 1989, and I was already living in United States. But either way, I wouldn’t have been able to witness it since I was living far away from Berlin. It was a total shock when I heard the news. The bell rang and she has to continue with her teaching. Have a fun day teaching Tolle! Yuss has been around since February 2009. She is active in SocioTown, but I know her very little. I’ve seen her on the SocioTown forum a lot and from her posts & comments, I can tell that she has strong opinions and are not afraid to declare them. Her character got me interested and I want to know her more. After a few attemps, I finally suceeded to get a bit of her time for the interview sit-down. Nadia = Hi Yuss. I heard you are a soccer big fan? Yuss = Yes I am. I love watching the World Cup. I would paint my face with flags’ colors and stay up all night to watch the match. Some of the matches were at 3 o’clock in the morning. N = What is/are your favorite team(s)? N = And your favorite player(s)? Y = I’m a full-time medical student and will be finished next year for general medical. N = So how does the medical school system work? Y = 5 Years to get the General Medical Degree and then continue for another 2 years for Specialty Medical. N = How is the school so far? Y = It is good and very interesting, I must say. We interact with patients in our clinical days. We observe their health history and test results and try to come up with a diagnostic. Though, we are not allowed to do anything to any patient just yet because we are basically shadowing the doctors, but the doctors wants to know our input. At this moment, we only can do experiments with animals (such as frogs, rabbits, mice, and dogs) and give medicine. Their heart and spleen are the same as human. N = After you finished your general medical, what specialty would you going for? Y = I haven’t decided yet. I have 4 selections; Cardiology (dealing with heart disorders), Cardiothoracic (surgical treatment of diseases inside the thorax (chest), Neurology (dealing with nervous system disorders), and Gynecology (dealing with female reproductive system). I do know that I want to do work in the hospital. N = With so many dangerous disease out there nowadays, wouldn’t you be afraid of getting infected? Y = I ain’t a germophobic. I wouldn’t do medicine if I’m afraid. N = What made you decide on medical? Y = My interest started since I was a kid. My family is also around medical. My elder sister is a Public Held Organizer and the other sister is a Laboratorial Technician. N = Rumors has it that you carry syringe in your pocket at all time? Y = Yes! I may kill you with morphine on your spinal cord. So don’t drive me mad. Joking! We carry statoscope around, not syringe. Lol. N = I also heard a rumors that you like to terrorize new Socians. Y = Just Darke. When he first arrived, he frighten Sasuke and Fufu. So I told him that I would removed his heart and so on.